………..are in this photo of last years Life Activities Clubs poker card ride? The peloton gathers at the Eltham tennis courts at the hastily arranged time of 7.50 AM on a potentially rainy morning. This has arisen from the flurry of emails on the previous night. There is a need now to sort out the “spring/summer’ starting time. Ken has cycled solo from the wilds of Diamond Creek, Bruce, Rob, Leon and Lindsay from the comfort of their beds at Eltham. Where is Brian? As usual at the hint of wetness this man is clearly still in bed. How does he manage to have a shower if he dislikes water so much, does he get his head wet? The usual discussion – where to? Consensus is to aim for Tindals Rd via Warrandyte and stop on the way to show Lindsay and Leon the old Templestowe Hill Climb. On the way and the rain is holding off. A bit chilly but a nice day really. Starting around the back way alongside the station parking lot, Bruce has warned the magpie near the school crossing is extremely active! Wish the crazy bird would finish nesting and let us get on with our rides in peace. We stop at the old Hill Climb. Last used in 1987, Rob as the historian of the group informs that this, together with the Rob Roy Hill Climb was the only hill climb in Australia with a sealed track. We peddle up to the start of the big steep hill, approximately 45 degree steep and on a sharp curve. It’s amazing how those old cars managed to get up the slope. Bruce brags that he once peddled down the hill twice and lived to tell the tale. When challenged to repeat this today, his response is that he is now a lot older and a tiny bit wiser, so no thanks. Kind of sad to look at this site, and image what it must have looked like in its heyday, guys in old sports cars climbing up the hill, spectators standing right at the side on the track, now it’s a decaying relic of a long past era, in fact in twenty years the grass will have overgrown the track totally and it will be no longer recognisable as a once vibrant venue and an integral part of Victorian motor sport. Rain looks likely so the decision is taken to just go on to Pettys Orchard for coffee. Seems like some members have a fondness for the apple crumble, watch that waistline! It’s a long coffee break, we have plenty of time to kill. In that leisurely time we manage to solve about half the word’s problems, which is not bad going. On the way back, Bruce leads the peloton up our own hill climb. A rocky steep climb up a long and winding hill, then we pedal down again the other side and meet Westerfold’s park. Personally I think it’s a silly thing to do, ie just peddle up a hill for no reason but to peddle down the other side, but I guess that’s what the chicken thought as he crossed and recrossed the road! On the way home the men’s shed group takes over and Leon leads us to various sites which may be suitable for the shed. One worrying aspect is that at one site the council has informed Leon there was a building which could maybe be used, but there was only a concrete slab there, maybe this will be a virtual mens’ shed. Maybe a word in council’s ear to updated their property register. We stop at the Eltham scout hall to check out some land there. Finally we reach the tennis courts at about 12 pm, the same time we normally get there, but we only travelled a quarter of the normal distance. How did that happen? But this has been a great “boys on bikes’ ride. We had fun side tracking in different ways and lots of laughs and fun. Having the residue of a heavy cold I decided today to decline the company of the peloton and stay abed for most of the morning in an attempt to get rid of it – notwithstanding the 4*C temperature at 8.00am and the predicted rain – which, in keeping with general Thursday forecasts, didn’t eventuate – thankfully, I thought to have a lazy day. By mid morning I was up and feeling quite agitated about the fact that I really should be doing something – and the legs were telling me, loudly, that they needed stretching. The day had warmed up somewhat and donning four top layers, in deference to a wheezy chest, I headed for the shed to break out the bike, which I thought had lain idle (like me) for long enough, and struck out for the track. The riding conditions were pleasant and 10.30am on the track seemed to be dog walking time with many and varying breeds of pooches out on the leash exercising their owners for the day. The plan was to head through Eltham towards Heidelberg in the chance of meeting the boys on their way back from coffee – on the assumption that was their original destination. Turned out that I met half the peloton in the forms of Leon, Lyndsay & Brent just before the Eltham lower park – the rest of the group having opted to push on to Fairfield – or somewhere else? After returning to Eltham with the three fellow Omnicyclists I left them after our usual chat at the station and decided to head up Main Road to Research and return to Dimo via the Aqueduct trail. This is a rather pleasant ride, especially as up to Research is a lengthy but fairly gentle upward slope which lets the legs know they are working, but not painfully so, and on reaching the top it’s pretty much a down hill run all the way. You get on that part of the trail about a quarter kilometer north of Eltham Little Theatre (a short but “challenging” incline) and from there an approx 4km ride gets you back to the Diamond Creek Trail at Allendale Road. 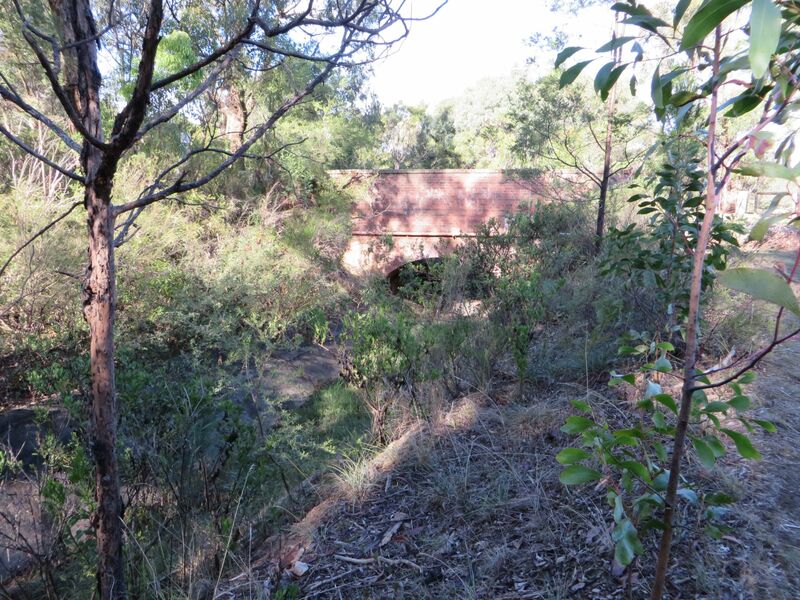 This section of the old aqueduct runs from Research to the old syphon on Allendale road Diamond Creek. The construction of what was known then as Watts’s River Water Supply commenced in August 1885 to bring an adequate supply of fresh water to the bourgeoning, but apparently polluted, Melbourne City. Less than six years later, in February 1891, it was in full operation and renamed as the Maroondah Aqueduct. Melbourne appointed a J. Hugh Davies, of the Railways Department, to locate a suitable catchment and cost of ducting a water supply to the city. 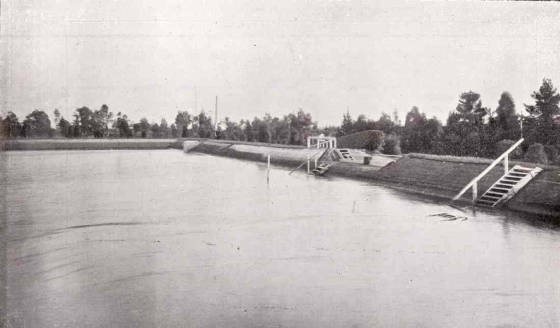 He chose the Watts River at Healsville and commenced a survey to create an open channel through the hills delivering water to the Melbourne City holding reservoirs in Preston. This is presumably the origin of the suburb called Reservoir, situated just North of Preston. 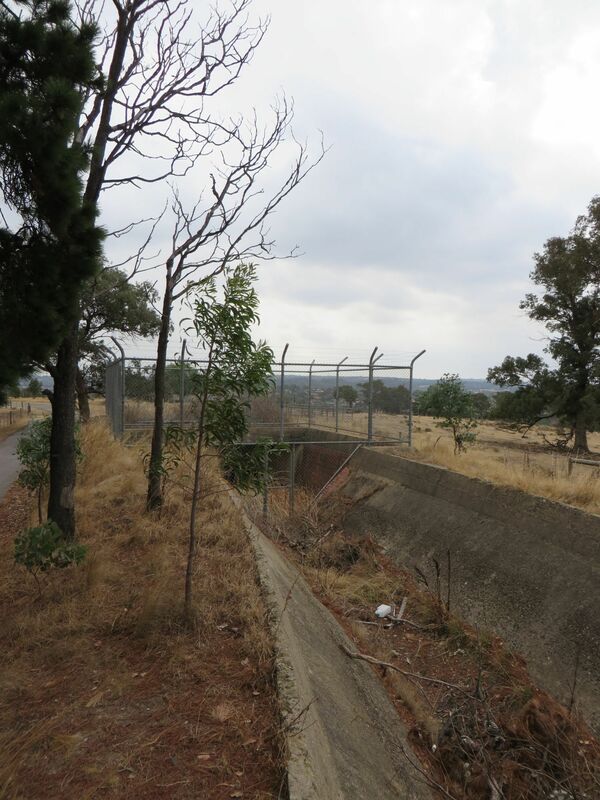 William Davison, a Melbourne Supply engineer, designed and directed the project which was to become one of the three major water distribution facilities at the time, along with the O’Shannassy and Yan Yean projects. It was 66 km long of which 41 km were constructed of open brick and cement lined channels and pipes with a fall of 1 foot (30cm) per mile (1.6 km), 10 km of tunnels and 15 km of inverted siphons to carry the water over creeks and valleys. Three of the tunnels were around 1.6 km each and the longest 1.9 km (or 97 chains) – a surveyor’s chain being 22 yards (or the length of a cricket wicket). The aqueduct was designed to carry 50 million gallons per day (225 megalitres) but the capacity was only 28 million gallons on commission, so in 1908 its height was raised and by 1915 it was carrying 29 million gallons per day. Interestingly, at the time, there were 900,000 residents of Melbourne and the cost of the project was 800,000 pounds – less than one pound per resident. 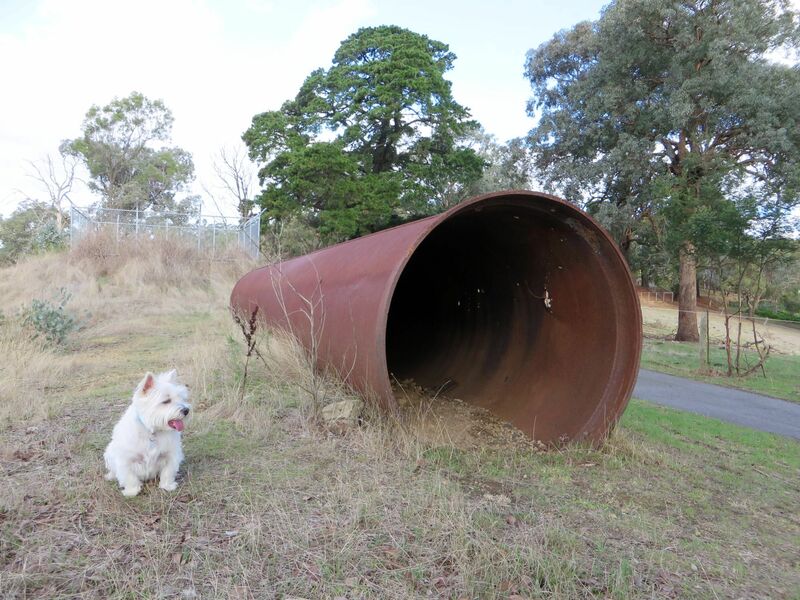 I think this rather remarkable piece of historical engineering is probably quite unknown to the greater part of the Melbourne population and it’s fortunate that some sections of the original 66Km remain intact – albeit some parts have been used for conveniently dumping rubbish by the lesser concerned citizens of our region. It’s also fascinating to reflect that it was actually completed in 6 years and all the work carried out without the assistance of modern-day machinery. 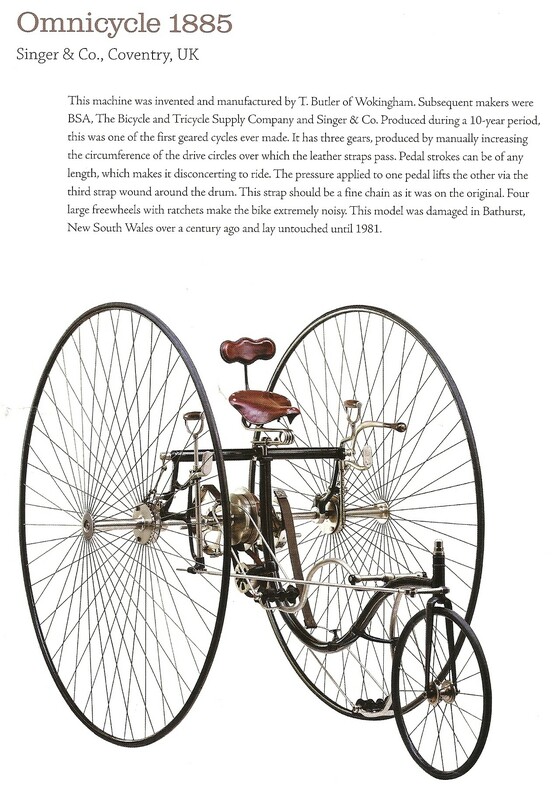 For anyone who would like further reading on the subject the following web site by Bob Padula contains much information, maps and photographs, old and new, of this project that most certainly played a major part in development of the great city that Melbourne has become today. Thursday arrived, and finally a reasonable forecast, with the 20-30km/hr Northerly winds left in the “small print”. Bill made the running embarking Metro at Wattle Glen, followed by “Captain Nick”, BasOMNI, and rampaging Rampo at Diamond Creek. The usual passengers on this train couldn’t believe that 3 more fine OMNICYCLE Blokes could squeeze in at Eltham. Linz tucked his bike away with usual aplomb, leaving Brent and Lou to torment new embarkees at every Station with a well planned obstacle course to get past their bikes……..manly OMNI endeavours. There was a muffled passenger collective cheer as 7 fine OMNICYCLE Blokes left the train at Jolimont. By goodness it’s cold was the polite way to describe the weather when we alighted. Never mind, we travelled down the north bank of the Yarra, eventually past the Container Terminal, across the Maribrynong River, and against the collective will of our bikes, turned left instead of the usual right. After some smooth riding, and some unexplained detours, we finally made it to Williamstown, for a well deserved coffee at the Pier. Brent had the inspirational notion that we needed “internal warming” and escaped to the Fish & Chip shop next door sweating over the “warming oil in the cooker” for hot chips, while the rest of us huddled in the relative warmth next door waiting for our coffee. The coffee and chips arrived simultaneously, and both were consumed with elegance………and if you believe that, you need to come on an OmniCycle journey. Off again following the coast around to Altona, where BasOMNI declared he had a “reasonable” lunch stop in mind. An imposing parade of Omnicycle up and down the main street followed……….could have easily been Hell’s Angels on any other day, and the waters were parted as we returned to Melissa’s for lunch. The staff obviously didn’t see our street tour, and were underwhelming…….but the food was adequate, and reasonably priced……..important attributes for we the mega-rich Omnicycle. The collective after-lunch decision was to go on, under Captain Nick’s guidance……with his dubious maps. 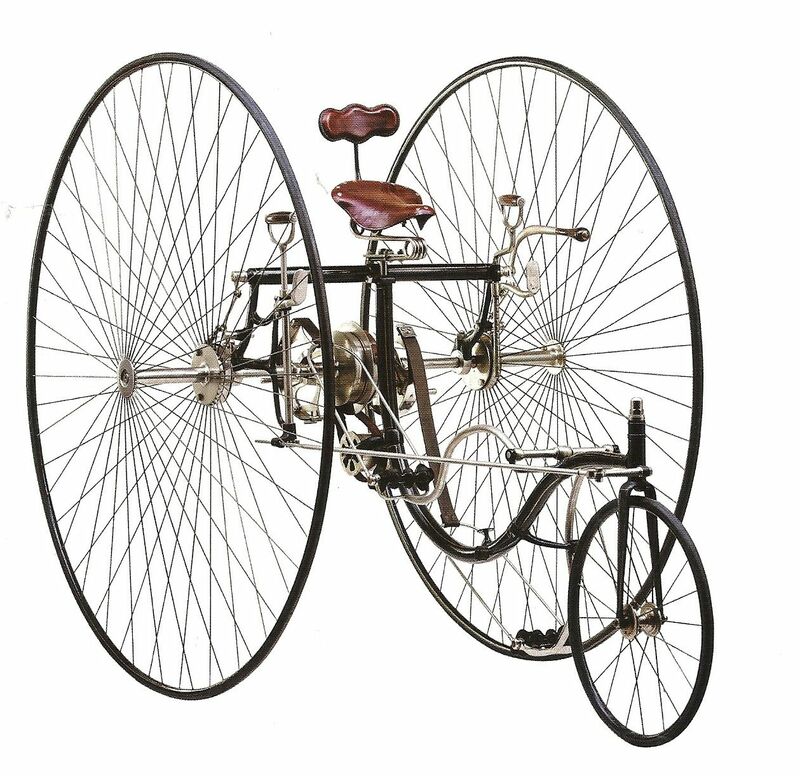 Lou was not happy with the width of the bike track when confronted with “restrictive barriers” on the track so attacked them with suitable Omnicycle vigour……….and unfortunately came off second best, as did other cyclists judging by the heavy scuff marks on the barriers. His never say die attitude to push on was applauded by all. The bike track around this Altona area stays close to the coast, and an astounding maize of wetlands that would never be seen other than on a bike. It was really interesting to see the opulent side of the once derided Altona. The cycling had been easy with mainly flat tracks, but the final push back to Point Cook Road, and eventually “Aircraft Station” was in to the stiff northerly, and reminded us of our limitations. A platform change at Southern Cross, and a train change at Jolimont had us heading home after a great ride exploring new cycling tracks. A big thank you to Captain Nick for organising this ride, proving there are few bounds well-organised Omni-cyclists are not capable of taking on. And so it was that we set out from Marngrook oval, Bill, Barry and Ken heading for the meeting place by the tennis courts at Eltham. Unfortunately, Bas suffered a puncture and decided to return home only having one spare tube. A good roll up there in Eltham, Bruce,Brian, Rob, Brent, Lou and we decided to head for the Caf at NMIT Fairfield. Apart from a dispute between one rider and his front tyre, (no names – initial Rob) the ride was pleasant and brisk. The multi-tasking abilities of OMNICYCLE Blokes is amazing. As well as keeping the pedals turning, conversations were maintained and hopefully, we all returned home enlightened! The coffee was good and a rousing version of ‘Happy Birthday’ was sent over the airwaves to David in Darwin.He was mightily impressed with the rendition and asked if we sang together as a choir! The return journey was without incident and the Group asked if Bruce might lead us on a trip up the Merri Creek on 19th June. Long range forecast – 17deg,sunny with a few clouds! What a day for a ride. 22 degrees, sun shining, so lets’ go. Only a peleton of 6, Bruce, Lou, Brian, Brent, Bill, Rob. Ken was away on Cota business, Leon on hols in America(and sending fine photos back) Lindsay away, and Barry was there in spirit, sending encouraging emails. Nick off sick recovering from a growth being taken from his leg, but we arranged to meet him for coffee. The health conscious seemed to favour apples crumbles and pies at Petty’s Orchard. Beats me how a huge helping of these items could be considered healthy, maybe they cause a healthy mind! Was a great ride up the trail, (led by Bruce in an extremely competent manner, with only a couple of dead ends) then time to check out the new trail from Tindals Rd to Eastlink, had fun riding alongside the bridge still to be completed, but this section is just about completed, only some bitumen to lay, and Brian’s son has promised to sort this out. 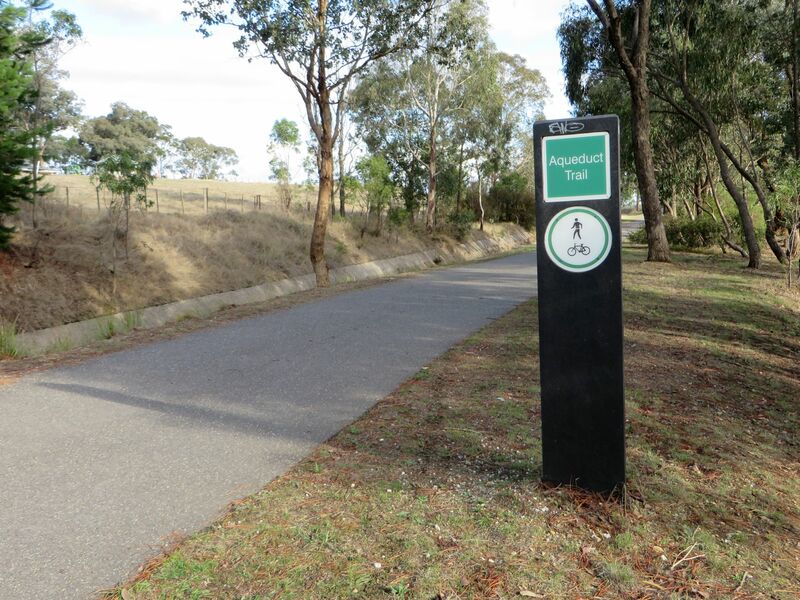 This section will allow us to continue on to the Eastlink trail, and we could do a big circuit going back to Heidelberg and joining the Yarra Trail and back to Eltham/Diamond Creek. A rough offroad ride down Springvale Rd and back onto the Warrandyte trail, then a spring to Petty’s for coffee and cake. Yum, yum. Good coffee and better cake. Also good company because Nick did appear, having coming in via road. Good deep and meaningful conversation also, we reckoned if there was an OM:NI party, the country would be in great shape. Back home to Eltham and Diamond Creek, and a fun ride. Nineteen degrees and showers, that was the forecast and seven optimistic OMNICYLE Blokes set out in three cars for the starting line at Mt Evelyn. Bill and I were the last to get there only to learn Bruce would not be along for the ride. Over coffee at the Sourdough Café we learned that Bruce and Geraldine’s dog Freya, had had an early morning epileptic fit. In an attempt to calm her so that she wouldn’t come to any harm, both Bruce and Geraldine sustained injuries requiring medical assistance. So off we set – us Mountain (or Mounted) Men pedaling into the Mount Evelyn ‘Mist’! Simply cruising down the first 7/8 klm’s, we soon came onto the gently rolling trail which makes up most of the ride. Two first timers on this annual ride, Lou D and Rob J were enjoying the change from our usual routes and – the scintillating conversation! It didn’t seem to take all that long before we arrived at Launching Place to be greeted by Nick G.
Well on the way to recovery from an illness, it was so good to see the determination shown by Nick to complete at least part of the ride. Well done Nick! By this time the ‘Mist’ had lifted and we cruised on in to the beautiful town of Warburton. It has become ritual for us to have lunch at the bakery by the river. Once again, the fare did not disappoint. The bakery was well patronized and a large group of riders and day trippers were there to savour the offerings. After a short rest and a walk along the main street through the shopping centre we set off for the return journey. We all travelled rather well and were quite prepared for the last 7/8 K’s which finished off the trip. Arriving back at the sourdough, all agreed it was a great day, a nice change from the usual, and that we should pencil it in again for April 2014. Riding today were – Bill B, Brian A, Rob J, Leon H, Lindsay C, Lou D, Ken R and Nick G.
Is Ken wondering where his pie has gone? Could the culprit be looking a bit serious about this? – or is there a knowing smile! There always has to be one rider a bit left of the cog! OK we know it’s a long way home – so back on yer bikes lads! Farewell Warburton – till next time.